Nico was diagnosed with a baseball-sized brain tumor during the first week of his summer vacation. Tattoo artist, Rudy “Doc Ink” Baltier (background left) organized a fundraiser Sunday at Chimera Body Art on Lancaster Boulevard to raise money for Nico’s family. LANCASTER – A fundraiser was held at a Lancaster tattoo shop Sunday for a Palmdale boy battling a brain tumor. Nico Martinez was diagnosed with a brain tumor during the first week of his summer vacation this year. Nico spent the next 30 days in the hospital and endured four surgeries, during a three-week period, to remove the baseball-sized tumor that was wrapped around his brain stem, according to his mother, Erin Mize. 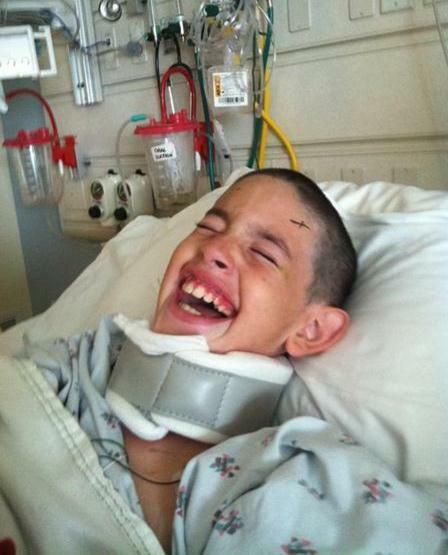 Nico managed to smile and laugh throughout his hospital stay in order to lift his family’s spirits. Despite the trauma of the surgeries, Nico kept his spirits up and managed to smile throughout the process, said his stepfather Demitrius Koumos. Fortunately, Nico’s parents have insurance to cover the cost of the surgeries. But his aftercare has taken a financial toll on the family, as both his parents are currently unemployed. 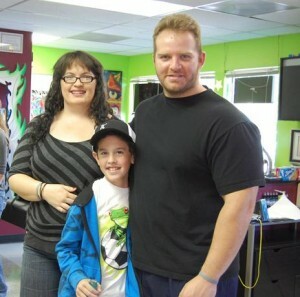 On Sunday, Nico’s family got some much needed support from Chimera Body Ink on The BLVD. “I dedicated the whole entire day to him, which is 50% off tattoos, and 100% goes to Nico and his family for his bills,” said owner Rudy “Doc Ink” Baltier. Nico’s family needs your help. Baltier said he was especially moved by Nico’s story because he has a son named Nico. “I’m really lucky that my son is 100% healthy, so the least I could do is help somebody else,” Baltier said. Sunday’s event raised $1,582 for Nico’s family. The funds will allow the family to purchase necessary medications, as well as costly vitamins and nutritional drinks that are important to Nico’s recovery. But Nico’s journey to recover is just beginning, and the family needs your help. Loved ones have set up a website to allow for public donations to Nico’s family. To donate, visit www.helpnico.com. The family has also created a video, which chronicles Nico’s story. 14 comments for "Fundraiser held for local boy recovering from brain tumor"
Christy is COMPLETELY right! Erin has been my best friend for 18 years and I have never met a more loyal, loving and dedicated mother / friend! She loves and gives with her entire soul and there is nothing in this world she would not do for her children. In fact, she has almost always worked full time to provide a good life for them. This meant however that she had to sacrifice precious time with them. So in December, she decided to resign from her job so that she could be more of a part of their lives while she worked on finding a new career with more flexible hours. I believe this is what saved Nico’s life! If she had continued to work, she would not have been home to recognize his symptoms. As the Dr’s have said, without prompt medical attention, it was only a matter of time before Nico had a seizure and died! And Demitrius has strived to no avail to find work to help support the family. Times are tough and this is a wonderful family in genuine need. Please help them. Lady, I’m so glad YOU said something to this and not me..
Erin is nearly the strongest mother I know. Accusing her of being anything but is seriously disgusting. It is really sad when there is a time of need and someone comes along and tries to cut them off at the knees. Obviously your an angry person needing to lash out at those who have been afflicted. If you think this makes you look big in our eyes, you are sorely mistaken and I feel sorry for you. God bless their family and especially this little boy who has managed to stay positive. [removed]. They are out of work cause she quit her job and the stepparent has almost always been out of work. She is using this situation to gain money while playing on her sons illness. It makes me sick. I COMLETELY disagree with you. If you REALLY know ERIN, REALLY know her, you would not say such [removed] yourself. I speak for her as I have known her for 17 years! She is a giver. If you ever needed ANYTHING she is there to help! She does what she can. She has been there for me thru thick and thin. And i speak for many. She is an amazing woman, you obviously dont know anything! ! Using her son to play people on her sons illness is [removed] stupid! YOU make ME sick. She loves and adores her children! She would do anything for them. I don’t know why you believe that ridiculous lie. If you have children, be so lucky they are healthy, if not no wonder you don’t understand what they have endured with the thought of possibly losing their child. He has battled a fight NO child should ever face! Giving is not something me and my family have thought twice about! He will have to endure surgery for the rest of his life! IMAGINE THAT! While everyone has gone on with their life, he has to be reminded every time he steps foot into the hospital to get ready for surgery. I’m 32 and I have never had an MRI, he has been in that machine more times than anyone would like. He had been on that surgical table going thru some scary [removed], YOU would cry about! And he will have to go thru these procedures for the rest of his life too! He was stripped of his summer, and his life forever changed! And I mean FOREVER! So let me remind you. This is about NICO! And if you don’t believe in this cause you donations are not wanted anyway! And neither are your lies! Wow. As a parent of a child cancer survivor I would like for you to know that I had to quit my job in order to be by my Son’s side while at Children’s Hospital. I lost many possessions but at the end of the day I did not care. They were just material things. I would do the same today as I did 14 years ago. My son has been cancer free for the past 12 years. Cherish every moment even if that means the loss of a job or worldly STUFF. This sounds like something that a very bitter, ill-informed person would say. I have known Erin and her family for quite some time, and she has NEVER put herself first. She took a risk to walk away from a job, so that she could spend more time with her family, that enabled her to realize that there was an actual problem with her son. If she hadn’t done so, her son would be dead. True story. The doctors told her he was INCHES away from a coma, which would have led to him being brain dead from the pressure of the tumor. How dare anyone diminish what they have gone through! Erin hasn’t even set up one fundraiser for her son! Demitrius & Erin’s friends have done all that! Even throughout this whole ordeal, they have maintained a great spirit, and a great hope that cannot be overshadowed by some ignorant person, who doesn’t even know this family. (I’ve known Erin for many years, and have never heard her mention anyone named Connie, so this tells me this is the EX, or a friend of the ex that has spawned such a hateful lie, just to be vindictive.) As for the “step-parent”, I have known him for just as long, and he is a loving father, and a very supportive partner to Erin. He has willingly took on 3 children and supported them and loved them for longer than their actual father has, and no one can dispute that. Thoughts and prayers go out to this young man and his family. This is a definite cause that I do not mind donating for! Let’s donate!!! On a side note, I hope the AV will have medical facilities in the near future to treat patients locally. i would like to hear Mike Rives (Hospital board candidate) state one more time why City of Hope would be “useless”…..